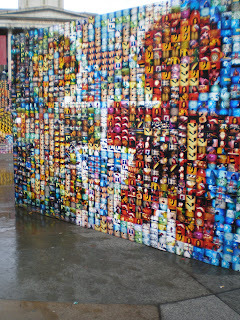 1) this one is for kelly...the cool mosaic i saw in tralfagar sqaure. absolutely beautiful. 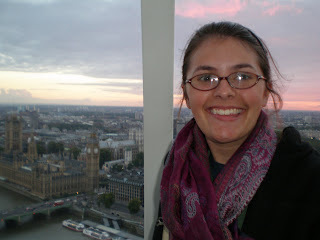 2) me inside of the London Eye! That is big ben down there and parliament. 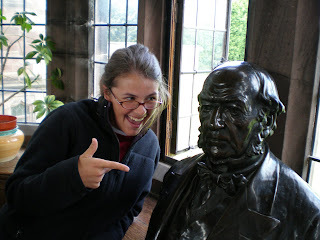 3) That's the man himself-William "Freaking" Gladstone. He was a prime minister and he built st. dieniols-where we stayed. He was the one who had that huge collection of books--which he read 22,000 of the 32,000! 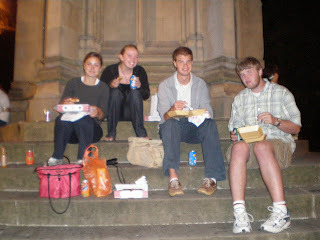 4) hilary, kirsten, david, and caleb eating on the steps of a monument. the food came from a street vendor. the cheapest and most delicious pizza. only 1.50 (pounds). yum! 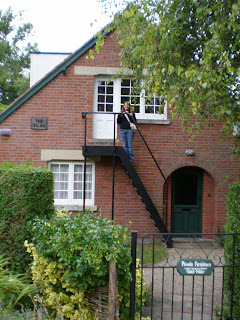 5) That is me there on top of the steps C.S. Lewis used to get into his house (the Kilns) in oxford. we got to tour the house. They had his writing desk (complete with pipe) set up and everything. OH and here is an interesting fact: Lewis and his wife Joy could play scrabble in 5 different languages! 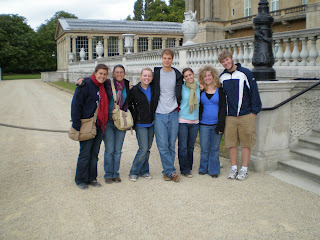 7) from left: Bethany, Me, Kirsten, Dave, Hilary, Jennifer, Caleb at Buckingham Palace after our stellar tour. Well that's all for now! Love you all. Sorry I have not updated this in awhile, I was in London all last week. I will attempt to give you a summary of the last week but I am sure it will be horribly inaccurate and I might keep using the same adjectives (i.e. cool, wonderful, and awesome) over and over again. Truly though it was a great experience, I will give you the highlights. I am exhausted after all that crazy sight-seeing though and I am glad to be in High Leigh just relaxing (well relaxing and doing homework) It is a much needed break though, away from the bustling energy of the city. 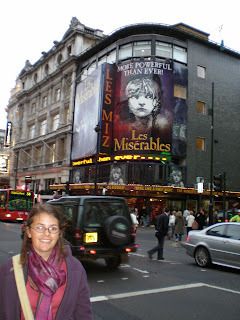 First night there we saw Les Miserables. Incredible performance. I hope to go see some more shows (maybe wicked...) when we go back to london another time. It was a great way to start out the trip. Thursday I went and toured buckingham palace. Got to see all the beauitful and ornate state rooms. Lavishly decorated of course. They also had the Queens wedding dress and jewelery on display. After the tour we walked around down by parliament and westminster abbey and saw big ben. Thursday night was our first Globe play-Love's Labours Lost. It was fun to see it done in traditional shakespearan dress on the stage it would have been first performed on (well a copy of that). We also saw Merchant of Venice there on saturday. Afterwards we ventured out to find abbey road. After asking some locals we finally ended up at the sacred crosswalk where they took that famous picture. We attempted to emulate it but alas we don't have the ability to stop traffic as those boys did...but our attempts still turned out pretty cool. We wandered around and then ended up at westminster abbey for the evensong. I was really tired so I must admit I wasn't too "moved" by the service...it more moved me to sleep. but it is still a really beautiful church and I might go back to see all the famous people buried there. We went out and got some chinese afterwards in china town and then ate magnum bars in picadilly circus ( a mini times sqaure) and watched the bright flashy advertisements. After the play on saturday we went and rode on the London Eye (the large ferris wheel) you go inside these large capsules that are clear so you can see out over all of london, the ride takes a half an hour. It was beautiful, we got up there right at sunset just to watch the orange sun descend behind the purple clouds...ahh it was amazing. Today was my last full day in Oxford. We are heading out to London tomorrow. The title is expressing my sadness for leaving here. Cocoa Krispies every morning, it has been a real treat. No really...Oxford is a sweet place. Monday we took a tour around the town with Colin Duriez (author of "The Gift of Friendship", a book about Lewis and Tolkien) He showed us all the popular haunts of those two, the colleges they taught at. We walked behind Magdelene college (where Lewis taught) on that path that he and tolkien would have walked. Apparently the conversation they had on that walk was very important to Lewis's conversion. Pretty cool place. I also ate dinner last night in The Eagle and The Child- a pub that they are famous for attending with their friends. It was delicious food..one of the best pubs i've been in so far. Today we went to Blackwell's-a bookstore with over 3 miles of shelves. To be honest it felt like a slightly bigger barnes and noble. I prefer the small used bookshops over places like that. It was nice though and I did buy a copy of Screwtape Letters. More books to read & carry...what am i thinking! 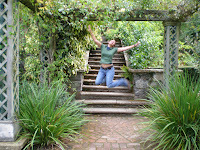 I am excited to go to London (no studying all week--just a couple of plays to attend) It will be fun to just explore. It will be our first of a few trips there so I will have plenty of time to see everything. Hello folks! Today has been quite a day. We left St. Deiniols this morning and went to Stratford-upon-Avon (home of Shakespeare) and saw one of his plays--Twelfth Night--at the Courtyard Theatre, performed by the Royal Shakespeare Company. It was an AMAZING performance. John Lithgow was in it:) (footloose....shrek...3rd rock from the sun..anyone?). He played Malvolio and did a wonderful job. Not that he was the whole show, the rest of the actors were brilliant. I am looking forward to seeing more plays--we are going to see two at the Globe next week. After the play we came here to Oxford. We are staying in what I think is a small catholic theology college. The rooms are nice and big and we have a whole common room with comfy couches to ourselves. We are just footsteps away from the Eagle and Child (known more commonly as the bird and the baby) the FAMOUS pub where the inklings (tolkien and lewis) would meet to have a pint and talk about their literature. I will definitley be poking my head in there this week. We basically just walked around tonight, scoped out some churches to go tomorrow morning and got some dinner. Kirsten, Hilary, Dave, Caleb and I got some delicious and cheap fried food from a stand called Hussain. A pizza was just £1.50---great deal. We sat on the steps of some monument and ate our dinner. It is nice here, there are lots of college kids, so I kinda feel like I fit in. While we were eating a guy came up to us asking for change--apparently he got kicked out of his housing and was homeless and needed money for a place to say. I realize he could have been lying, I am usually really skeptical about these things but a few of us did give him some change. his name was simon. if you think to for a minute maybe say a prayer for him...even if he was lying and just scaming us because we sounded like tourists, there is a small chance he was telling the truth, so i'm just going to hope that he was one of the honest ones and that tonight he has a roof to sleep under. Maybe this is just a surface observation, and if I really lived here I would feel differently but my oppression so far of the UK is that they are very concerned with humanity and i get this sense that humanitarianism (if that is a word) is strong over here. Oxfam stores are everywhere and it seems like every grocery store has products upon products that are fair trade. Maybe I am just blind to these things in America, but I feel like there is less of it there. Again maybe that is just a blanket observation, but it is the sense I get and it is one of the things I really like about this place. Well I think that should be it for me tonight. I need to check my laundry. Internet is FREE here-wahoo...so perhaps I will be using it more. Let me know what's up with things back home...I feel so distatched sometimes. I now have finally found the time to put some pictures up. I wish I could put them all up, but that would take FOREVER...considering I have already taken around 300. yikes! 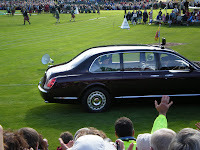 Starting with the top we have the Queen herself, she came to the highland games in braemar while we were there. 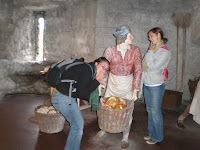 Next is Hilary and I brilliantly stealing bread from a baker at Sterling Castle. We are a pretty good team. 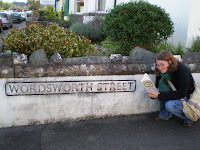 Reading Wordsworth on Wordsworth street. I found this picture to be essential. The view from catbells in the lake district. 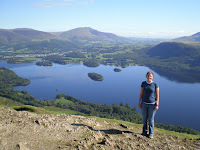 That is looking down on Lake Derentwater (I butchered that spelling) and the town of Keswick, where we stayed. The Bondant Gardens (again spelling wrong I am sure) in North Wales. It was like the Secret Garden with lots of lily pools and stone steps and wooden bridges. It was beautiful. 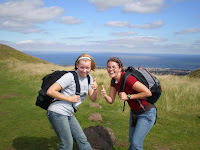 Going back in time-that is a picture of Kirsten and I on top of Arthurs Seat in Edinburgh. We were siked to have finally made it to the top. 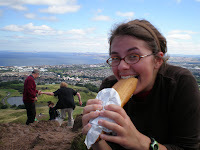 Last picture is of me and my TRUE love-baguettes. I know that isn't a lot. I realize too that many of the pictures I thought I had are actually on other cameras. Oh well. I hope that gives you a little bit of a recap. We are finishing up our time here at St. Deiniols. We leave tomorrow for Oxford, but first we are going to stop in Stratford and catch a matinee of Twelfth Night. i am sorry it has been so long since my last update. finding time to use the internet can be tough. thankfully DT has come to rescue, and allowed me to use his computer. It is about dinner time over here...so I don't have a ton of time to write, but I will give you a brief summary of my last week. We were in Keswick (in the Lake District) famous of course for William Wordsworth and Beatrix Potter. We explored both of their homesteads, and even saw the original illustrations of ms. potter's. We did a lot of hiking, the lake district is absolutely beautiful. Lots of lakes surrounded by small mountains and green pastures with lots of sheep. We were just minutes away from one lake where you could ride a boat to several stops and then get off and hike around. We hiked on the of the small mountains, cat bells (and no it has nothing to do with cats or bells). It was quite the hike, but the view was amazing. We sat up there for a while and had lunch and just relaxed. So far I've been impressed by all the places we have visited and the friendliness of the people there. We left the lake district on friday and we are now in st. deiniols in hawarden (pronounced harden) in wales. We are staying at a live in library, every english majors dream i think. The library has 250,000 books and lots of places to just sit and read. It is lovely here. I wish we could stay here for longer. I am definitely getting some much needed alone time/studying done. It is nice to be away from the city and the sightseeing and just be for a while. we took a trip to liverpool on sunday and walked around one of the docks and saw some cathedrals. I was actually pretty disappointed in them. They seemed more like commercialized tourist attractions than houses of the holy. Still we happened to catch both of them (the anglican and the catholic) during their evensong service. The singing was beautiful and uplifting. We are here until friday and then we move onto oxford. I hope I've given an okay update...but I really need to run. I'm hungry!! My internet is being timed. 12 minutes and counting. so I will make this quick. We are staying a youth hostel in braemar. We spent the whole day today at a highland gathering. Lots of men in kilts throwing large heavy objects, bagpipes, oh and the queen was there. It was a lot of fun, just sitting and people watching. there was even a guy passing out free hugs, how awesome is that! so now we move on tomorrow to the lake district (keswick in england) it will be a 5 hour drive or so. kind of long, but i am sure we will manage. i will have more access to internet there so hopefully i can finally get some pictures up! I've taken lots. until next time. love you all.